Brilliant! The album title, that is, and as with the confectionary of a similar name, it neatly captures the varied nature of what is enclosed within the packaging. Liquorish Allsorts, as might be expected, is a pretty mixed bag of music spanning RW’s career from 1973 to 2014, and if taken within the spirit in which this collection has been compiled, then there is much to discover and enjoy. The album opens with a relatively new piece, Prelude To The Ladies’ Valley, which as its title implies is a precursor to The Ladies’ Valley which concludes this album. This brief prelude has a timeless quality and something that wouldn’t be out of place on an Enid album. The main event, The Ladies’ Valley, was one of many highlights from the Decameron: Ten Days In 100 Novellas – Part II release and certainly one of its proggiest moments. The track sees Robert reunited with vocalist Jenny Darren, a lady who features strongly in his career. Jenny’s delightful vocal delivery offers a theatrical bent to the opening section, oriental in flavour and sits snuggly within RW’s complex keyboard arrangement. The middle section sees fellow Samurai of Prog members Marco Bernard and Kimmo Pörsti, along with guitarist Bogáti-Bokor Ákos, taking us through a great keyboard workout, before returning to the vocals to conclude. Versions can be found on both the The Imperial Hotel (Samurai Of Prog) and also the previously mentioned Decameron Colossus Project box-set. A splendid track and one featuring Steve Unruh on flute and violin. The more classical side of Robert Webb’s music can be found initially in the quirky sounding Moog Fugue, written by Kerry Minnear (Gentle Giant). A strong arrangement, however I couldn’t really get past the Moog sound chosen, which had all the hallmark’s of a 70’s era sitcom theme tune. More successful is Bach Flute Sonata Allegro, with Rachel Hamilton playing the delightful flute melody, and although the reggae back-beat gives it drive, it does tend to make it sound a little corny. Carl Orff’s wonderful O Fortuna (from Carmina Burana) gets the rock/funk treatment. The old adage “you can’t ruin a great tune” is born out here. Possibly the most successful of the “classical” pieces is Quaterfoil, played here on piano, but originally written by Robert for his self-released Pieces For Harpsichord. Concluding the classical tracks is an adaptation of French composer, Louis-Claude Daquin’s Le Coucou (The Cuckoo). There’s a few real oddments to be found on the album. Runnin’ In, Runnin’ Out, which started life as instrumental circa 1979, is a demo piece with spoken words added later in 2014. Another strange one is The Journey By Camel, a quirky instrumental, written around the same time, and performed on a newly acquired Yamaha CS80 – an early polyphonic synth. The sort of track you might expect to hear in a music hall production on an Egyptian theme. Two years later saw the formation of third piece in this little section of curios. Considering this was a somewhat personal low point for Robert, Liquorish Torpedo is a bouncy number. Now Liquorish Allsorts contains its fair share of pop songs and the two strongest, for me, are Why Oh Why and Takin’ Part, both written in 1974. Scored around the time of his involvement with the band Merlin and with the aim of writing a hit song, the aptly titled Why Oh Why didn’t go on to be a hit, but certainly could have. Indicative of the pop culture of the time, it has a neat acoustic guitar motif, catchy melody and some Moog lines thrown in for good measure. The up-tempo Takin’ Part, performed by Merlin, again has a catchy guitar line, this time on electric guitar and a rich vocal chorus (think America or The Eagles). The track boasts a Floydian mid-solo section, courtesy of Mr Webb, before the verse/chorus concludes. 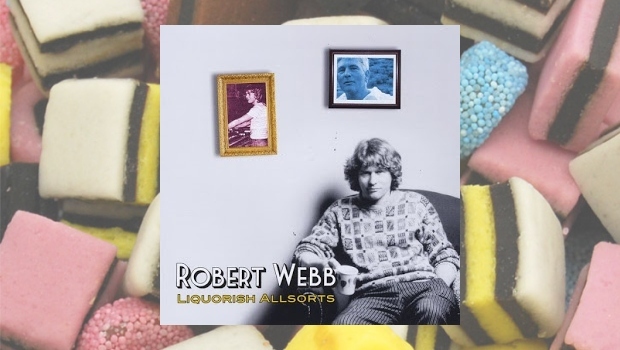 As mentioned earlier Robert Webb’s collaborative work with vocalist Jenny Darren formed a substantial part of his early recording career and there are three tracks, from this first union, on Liquorish Allsorts. Written in 1979, Grand Canyon Of My Dreams, is perhaps a little ahead of its time, but despite a strong band, is somewhat forgettable. Destiny is certainly the most interesting of the songs here and written around the same time as Grand Canyon…. Opening (and closing) with mellotron sections, the track drives at a steady pace, pulsed by the precise drumming and interesting bass parts. The vocals of Frank Holland and Jenny Darren are tantalisingly haunting and the overall arrangement warrants several listens. Oceans Away is a piano ballad with Jenny Darren turning in a fine vocal. RW would later add keyboard strings to flesh out the arrangement. And there we have it, a cross section of the music of Robert Webb spanning some four decades. With music that covers ‘demo material’ to the highly polished arrangement from Samurai of Prog, then there’s always going to be a strange flow to the album. But, and as intimated in the opening of this review, if entered into with the spirit of the project, then Liquorish Allsorts is certainly well worth the sampling. Covering some forty years and numerous bands – it has not been possible to separately list all the musicians involved.